Will you look at that, I'm in a show! It's been a while, and I'm honored to be included. please do stop and say hi. 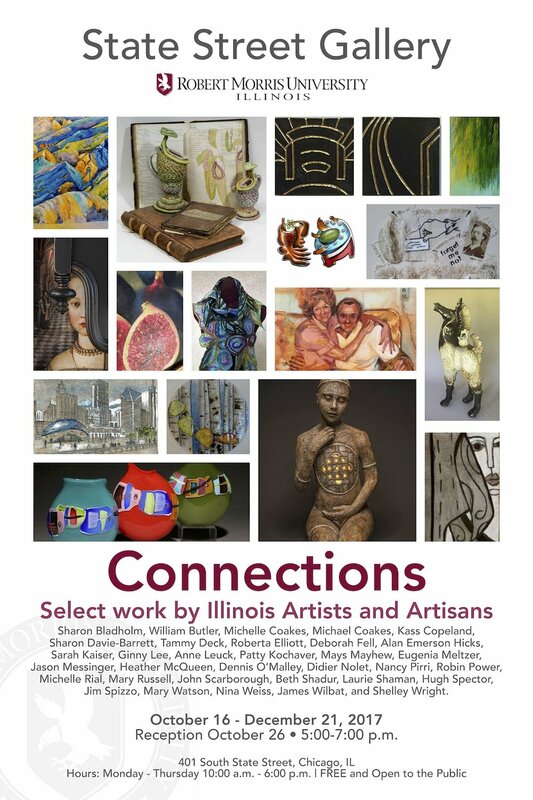 The State Street Gallery is pleased to announce its fall exhibition, Connections, highlighting the work of over 30 artists and artisans living and working in Illinois. The juried collection is largely tactile and three dimensional. A variety of ceramic techniques and applications will be represented including the unique Saggar firing, the soulful expressive figures of Robin Power, the imaginative and blooming plants of Sharon Bladholm and the fun and funky tiles of Jason Messinger. Contemporary will connect with traditional in a vast array of media including blown and fused glass, photography, textiles, oil painting, paper maché. Work from well-known Illinois Artisans members (formerly with the Illinois State Museum) will include the graceful curves of forged steel by Roberta Elliott, and vivid landscape paintings by Didier Nolet. The exhibition will continue to evolve with a sculpture-in-progress by the ever entertaining and inventive Alan Emerson Hicks. This is the 5th curated exhibition hosted by the galleries of Robert Morris University that celebrate the vast talents of artists and artisans living and working in Illinois. 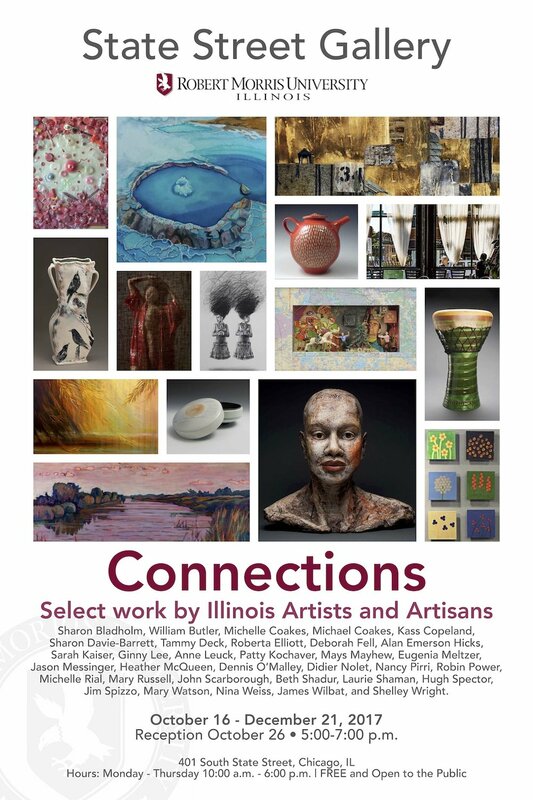 Connections Select Work by Illinois Artists and Artisans will be open October 16 and will run through December 21, 2017. The artists’ reception will be held on October 26 from 5:00 until 7:00 p.m. The gallery is located on Robert Morris University’s Chicago campus, 401 South State Street, Chicago, IL 60605. It is open Monday – Thursday, 10am – 6pm. It is free and open to the public. Contact Shelley LaMantia-Wright for further information at swright@robertmorris.edu or 773-844-1717.